Antivenins is used in dogs who have received bites from viperine snakes, such as rattlesnakes, copperheads and cottonmouth water moccasins. 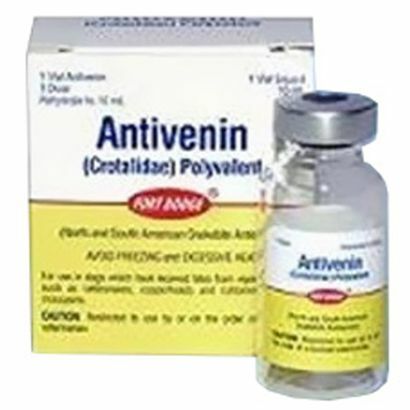 Antivenins works by neutralizing the venoms in patients via passive immunization of globulins obtained from horses immunized with the venom. Must shipped Express 1-2 Days. A $29.95 flat rate fee is charged for all orders. Someone should be present to sign for and receive the order when it ships to you. For more shipping info click here. Directions: The dose varies from 10 to 50 mL (1 to 5 vials), intravenously, of rehydrated Antivenin, depending on the severity of symptoms, lapse of time after the bite, size of snake and size of patient (the smaller the body of the victim, the larger the dose required). Additional doses should be given every 2 hours as required, if symptoms such as swelling and pain persist or recur.